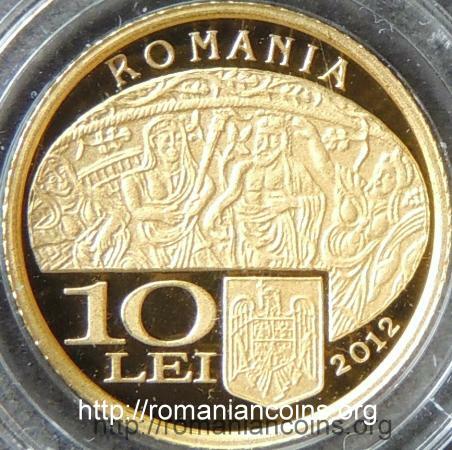 Obverse: ROMANIA, face value 10 LEI, coat of arms of Romania, year 2012, a part of the patera from the Pietroasa Hoard, with several characters Reverse: a perspective view of the patera, above this image the statuette in the center of the patera, above and below inscriptions "PATERA" and "TEZAURUL DE LA PIETROASA", the last meaning "HOARD FROM PIETROASA"
The noun "patera" is used for a shallow and broad dish used by the ancients for libations (for pouring liquids - especially wine - as offering to the gods). Odobescu translated the word "patera" in Romanian as "strachină"  - the name of a shallow and often adorned dish, used by Romanian peasants as plate. The patera from Pietroasa has almost 26 centimeters in diameter and weighs 2097 grams . The object is composed from two sheets of gold soldered together. The inner one is adorned, and the outer one is plain. 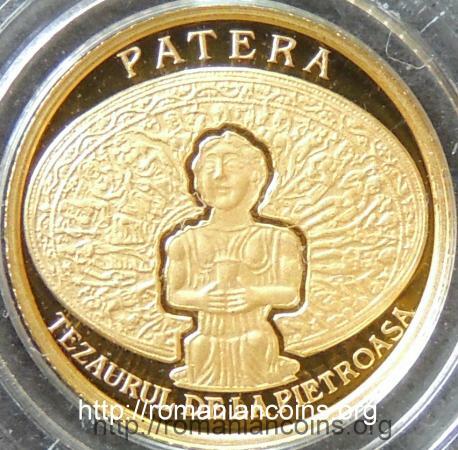 In the middle of the patera lies a woman wearing long tunic, sitting on a throne without back and holding cup with both hands. The sides of the throne are adorned with grape vines. The statuette is surrounded by a frieze on which are represented a shepard with his dog and several other animals. Toward the outer rim lies another frieze, occupying the largest part of the patera's surface, on which 16 characters are represented. Near the outer edge swirls a grape vine liana. Unfortunately until the present day a generally accepted interpretation of the representations on the patera does not exist. The characters were described either as Germanic deities, or Greco-Roman - possibly Cybele with her henchmen , . 1. Burda Şt., Tezaure de aur din România (Gold Hoards from Romania). Ed. Meridiane, Bucureşti, 1979. 2. Leahu Doina, Arbunescu Al., Oanţă-Marghitu Rodica, Dumitriu Luminiţa, Mălăncioiu Raluca, Amarie M., Oberländer-Târnoveanu Al., Tezaurul. Ed. Age-Art, without place and year.